Mold can grow rather quickly anywhere there is moisture. 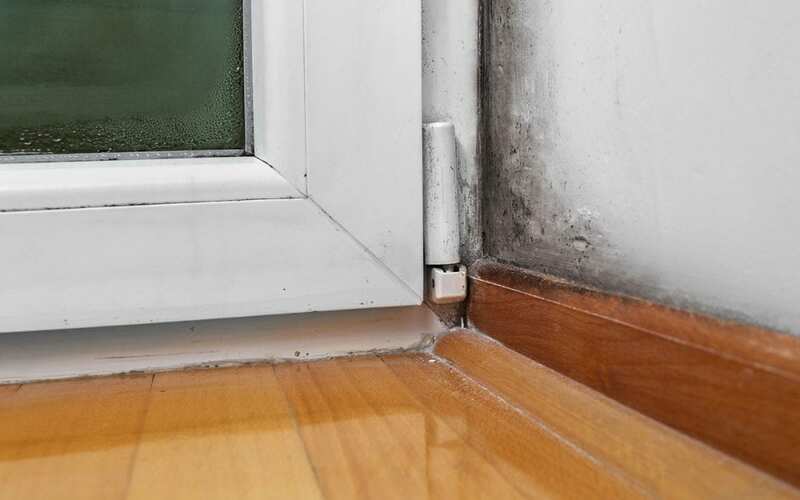 In your home, these areas are often your bathroom, kitchen, or basement, but mold can grow throughout your home if the humidity level is high or there is moisture intrusion from a leak. Mold spores are small and easily enter the lungs, triggering allergies and other health problems. It can be expensive and difficult to remove mold once it has set in, but you can take steps to prevent mold growth in your home. The EPA recommends indoor humidity levels between 30 and 50 percent. You can purchase an inexpensive moisture meter at any home improvement store. Pay attention to signs that your humidity level is too high. These signs include condensation or moisture on windows, walls, or around pipes. If you notice signs of moisture or your meter indicates high humidity, you will need to take steps to prevent mold growth. Keep your kitchen and bathroom well-ventilated and run an exhaust fan to prevent excess moisture. Always run the bathroom exhaust fan during and for a few minutes after showers to remove moisture from the air. Cooking food on a stove can also create excess moisture, so it is important to run the exhaust fan above the stove when you are cooking to help clear out the moisture. Make sure your gutters and downspouts are moving water away from the house. Full or damaged gutters can cause leaks if the water is not able to flow through them correctly. Regularly inspect your gutters and outside drainage to ensure water is not pooling around your foundation and entering your home. Regularly inspect your pipes promptly and fix any leaks. Pools of water from leaks are breeding grounds for mold. Moisture and mold growth from leaky plumbing can spread rapidly if the leak is not repaired promptly. Allow fresh air into your home to prevent mold growth. Do what you can to improve air circulation in your home by keeping interior doors and closets open and pulling furniture away from the walls. Improve ventilation in confined areas. Avoid carpeting in damp areas such as basements and bathrooms. Moisture will readily soak into carpeting and be difficult to remove. Use materials that are easier to dry, such as tile or other hard surfaces to prevent mold growth. If you do notice moisture or mold in your carpeting, the carpeting and pad should be removed and replaced. A home inspector can help you identify mold in your home and pinpoint possible issues that could lead to mold growth. Knowing potential problem areas can help you take steps to prevent mold growth in your home. Work with a qualified inspector to ensure your home stays free of mold. Carolina’s Best Home Inspections provides inspection services for home buyers, home sellers, and homeowners in Moore County, NC. Contact us to schedule our quality inspection services.